Ganesh Raghunathan received this message, one of eight SMS messages that day from villagers across the Valparai plateau in southern India. As he does each day, Ganesh added the update to his map of the locations of elephant herds that are monitored daily, in order to send out the daily alerts of these locations. Each afternoon at 4 p.m., Ganesh sends out text messages with the locations of elephants to all registered villagers living near the herds’ current locations, as part of a larger, ingenious program by the Nature Conservation Foundation to protect both people and elephants. Indian elephants (Elephas maximus indicus) in a roadside tea plantation. They normally do not eat tea leaves, and these plantations displace their native food-sources. Photo by Sreedhar Vijayakrishnan. Indian elephants (Elephas maximus indicus) once freely roamed the rich mid-elevation evergreen forests of the Valparai plateau in the Western Ghats, one of the world’s mega biodiversity regions, but they can’t move the way they used to. Ever-increasing commercial plantations and settlements have become obstacles to the daily and seasonal movements of elephants. Forests across the plateau have been largely replaced by plantations of tea, coffee, and eucalyptus (cut and burned to process the tea). The three crops give the region a bright green sheen, but none of these three perennial exotic plants is palatable to elephants, so for them it’s like being in a desert, with small isolated patches of edible native plants in the rainforest fragments scattered among the large plantations. The conversion of a diverse natural forest into monoculture cropland has both reduced and fragmented the habitat available to elephants, requiring them to walk long distances to reach food and shelter found in the forest islands among the plantations, while trying to avoid people. The industry has attracted nearly 70,000 people who harvest the wood, tea leaves, and coffee beans, making these areas — particularly the tea plantations — full of human activity during the day. People and elephants in this region tend to leave each other alone, since elephants don’t eat tea or eucalyptus, and only occasionally nibble coffee beans. Elephants avoid people when possible, creating an environment in which people are most likely to run into elephants moving from one fragment to the other at night, when neither party can see the other in advance. While these unexpected nighttime encounters rarely result in harm, they still are the primary instance of elephant-caused human injury. If elephants are surprised by the sudden appearance of a person in front of them, they may panic and charge. However, with advanced warning of elephant locations, most conflicts can be avoided. Armed with knowledge, people can take alternative routes, or they can make noise at the edge of their village to get elephants to change direction. 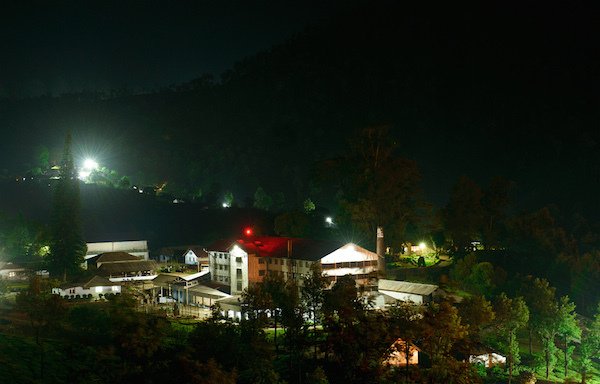 A red beacon lights up in a village, warning locals that elephants are nearby. Photo by S. Aneesh. Researchers of the Nature Conservation Foundation (NCF) began working in 2002 to understand elephant ecology and behavior, and their interactions with people residing in the plantations. Through their study, they learned that a lack of timely information on elephant whereabouts was the primary reason for the surprise encounters that can lead to human injuries or fatalities. With ensuring the safety of both species as their primary goal, the NCF team has won the support of the region’s approximately 46 estates that are managed by seven major plantation companies while engaging villagers to help them develop and implement a creative, low-budget elephant warning system. Locating elephants: Each day, three NCF team members span out to look for the herds, taking into account location information collected by collaborating villagers, and report the locations of those they find. In addition, the team receives calls or texts from local people and Forest Department field staff with information on elephant whereabouts. Based on that information, the team uses three separate activities to inform people of elephant movements and presence: a bulk text messaging system, streaming information on the local television channel, and alarm beacons in key villages. The bulk SMS/text system: Research conducted by NCF’s Ananda Kumar between 2002-2007 found that elephants in the area are most likely to be found within two kilometers (1.2 miles) of their previous day’s location. Because of this, villagers living within a two-kilometer radius of any recent elephant alert locations who have signed up to receive text messages of herd whereabouts will receive an alert. The locals, in turn, spread the word to friends and families, all of whom can then take necessary precautionary measures while stepping out that evening. Local TV: The NCF team also broadcasts elephant sightings on TV. Viewers of the local television channel can watch elephant locations being streamed across their TV set on a continuous basis. However, as people have upgraded to DTH (Direct To Home) and satellite television over the local network, this messaging form is reaching fewer viewers. Alarm beacons: Not every resident of Valparai has registered to receive daily text messages, or even owns a mobile phone or TV, so the NCF team created a new application for their own mobiles that communicates to an entire village through centrally located signal beacons. These beacons are placed in strategic, elevated locations to provide maximum visibility to both residents and visitors to the area, who would otherwise be unaware of elephant presence. When elephants are known to be less than one kilometer (0.6 miles) from an alarm beacon, a call or text message sent by either NCF or one of two designated villagers turns on the beacon, which emits a blinking red light. Any of the three callers can also call to turn off the light, and, to be sure that they working correctly, NCF checks all light operations every morning. Many fatal and injurious elephant-human encounters occur as people walk home from bus stops. To address this, NCF developed a fourth component to the warning system that streams SMS-based announcements of elephant whereabouts across digital signs displayed on local buses to inform riders that they should be particularly careful or perhaps even avoid certain stops where elephants are present. 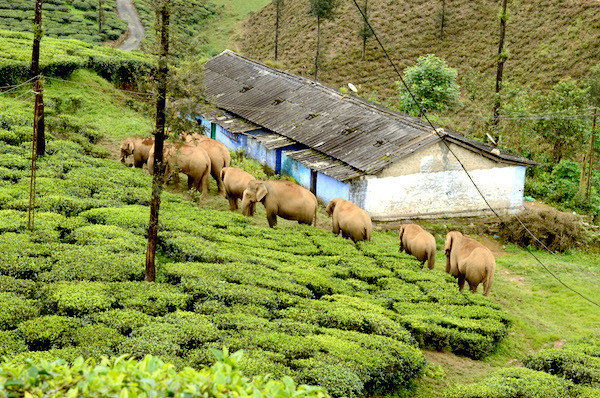 Elephants often have to walk through human developments, like this tea plantation, to get to their preferred habitats. Photo by P. Jeganathan, Nature Conservation Foundation. The elephant location advisories, which initially reached 700 registered families (recipients must request to be put on a list), now reach 2,800 families, and continues to grow. Of those to register recently, one resident joined after elephants entered his village and broke open the door and window of a building to reach grain stored inside. The damaged building was a workers’ club surrounded by houses, which were not damaged. The elephants, crossing between forest patches, had entered the area after breaking through an electric fence around it. Community involvement in receiving text messages, reporting elephant locations, and sharing information with neighbors has increased awareness, developed a sense of precaution, and generated ways to effectively avoid encounters with elephants, which, in turn, have helped locals plan their outdoor activities more effectively and safely. The warning system has reduced the number of injurious elephant encounters, with no elephant-caused human deaths or injuries reported in the region in all of 2013. However, in February of this year, in two separate incidents, people who ignored warnings and unexpectedly encountered elephants in the early morning hours were killed, underscoring the importance of continuing to inform local people not only of elephant locations but also on precautionary measures they should take to avoid harm if they do encounter one. People watch elephants near a tea plantation. By keeping locals informed of elephant whereabouts, the warning system is reducing human-elephant conflicts. Photo by SM. Ananda Kumar, Nature Conservation Foundation. 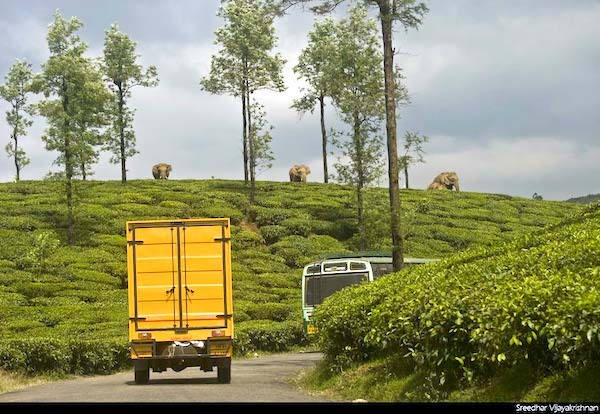 The safety and well being of the 70,000 people living among the Valparai region’s tea estates, as well as the ability of the elephant herds to move freely among areas with food, shelter, and water, depend on maintaining peaceful coexistence between the two species. The situation in Valparai is actually simpler than those of regions where elephants consume and damage food crops. Here, the safety of people and buildings, which often contain stored food, is of primary concern. According to Kumar, even when food crops are involved, early warning of elephant presence is critical to avoiding human injury and destruction of crops and property. With proper training, local residents can usually keep elephants from entering crop areas, which is easier than trying to drive them out once are already in a field. Kumar’s team has recently been contacted to help “negotiate” terms for peaceful coexistence between humans and elephants in the Western Ghats’ largest conservation landscape – the Satyamangalam forest division of Tamil Nadu state, adjoining the Nilgiri Biosphere Reserve. Their contribution to innovative conflict resolution will be critical to long-term survival of a viable regional elephant population. Over 80 percent of Indian elephant range is outside parks and reserves, with even herds that largely reside inside protected areas frequently moving outside to forage. Ultimately, the survival of these iconic, endangered animals depends on their ability to find food, shelter, and water in an increasingly human-dominated landscape. Elephants generally attempt to avoid people; this benevolence needs to be matched by human behavior that facilitates, rather than hinders, elephant movement and access to critical resources. In regions shared by elephants and humans, is important to understand elephant behavior, educate local people about ways to reduce conflict, and implement careful land-use planning that enables elephant movement among forest patches. Innovative effort to facilitate this, such as the work done by NCF*, is a major step towards minimizing stress and associated hostile interactions, and consequently saving the lives of both species that call this region home. *Elephant Family, Mohamed bin Zayed Species Conservation Fund, GUPSHUP Enterprises for SMS, Tamil Nadu Forest Department, as well as plantation companies and the people of Valparai, have all provided critical support to NCF’s human-elephant conflict prevention work. Kumar, M. A., Mudappa D and Raman T. R. S. 2010. Asian elephant Elephas maximus habitat use and ranging in fragmented rainforest and plantations in the Anamalai Hills, India. Tropical Conservation Science 3: 143-158. Available online: www.tropicalconservationscience.org. Kumar, M. A and Singh, M. 2010. Behaviour of Asian elephant (Elephas maximus) in a land-use mosaic: implications for human-elephant coexistence in the Anamalai hills, India. Wildlife Biology in Practice 6: 69 – 80. Accessible at http://socpvs.org/journals/index.php/wbp/article/view/10.2461-wbp.2010.6.6. Roever, C. L, van Aarde, R. J and Chase, M. J. 2013. Incorporating mortality into habitat selection to identify secure and risky habitats for savannah elephants. Biological Conservation 164:98-106. Rangarajan, M., Desai, A., Sukumar, R., Easa, P. S., Menon, V., Vincent, S., Ganguly, S., Talukdar, B. K., Singh, B., Mudappa, D., Chowdhary, S., Prasad, A. N., 2010. Gajah: Securing the Future for Elephants in India. Ministry of Environment and Forests, Government of India, New Delhi. Accessible at athttp://moef.nic.in/downloads/public-information/ETF_REPORT_FINAL.pdf. (05/01/2014) Overall, the brown bear is one of the most widespread and numerous bear species in the world. However, a subspecies called the Himalayan brown bear is not so fortunate. It occupies higher reaches of the Himalayas in remote, mountainous areas of Pakistan, Nepal, Tibet and India. 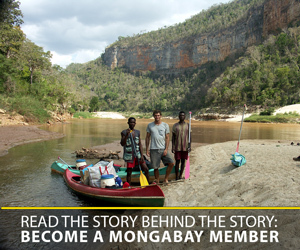 Its populations are small and isolated, and it is extremely rare in many parts of its range. (04/29/2014) For many years, Ramesh Agrawal has worked to spread awareness of the environmental repercussions of India’s coal industry to local residents, empowering them with information and speaking out on their behalf. In 2012, his tireless efforts shut down development of a major coal mine, which would have been the largest in the state of Chhattisgarh. (04/23/2014) The extinction risk faced by mammals is often in the limelight. But it may be surprising to learn that next only to primates, chelonians—or turtles and tortoises—are the world’s most imperiled vertebrate group. New research indicates that two such species are being threatened by hunting in the Western Ghats of India. (03/27/2014) In 1864, Walter Campbell was an officer in the British Army, stationed in India when he penned these words in his journal: “Never attack a tiger on foot—if you can help it. There are cases in which you must do so. Then face him like a Briton, and kill him if you can; for if you fail to kill him, he will certainly kill you.” In a stroke of good fortune for the tiger, perceptions in India have changed drastically since Campbell’s time. Tiger hunting is now banned and conservationists are usually able to rescue the big cats if they become stranded while navigating increasingly human-occupied areas. But is this enough to save the tiger?